Our generous donors will have the opportunity to record their family name for posterity. This is your opportunity to contribute towards the purchase of these works of art. Your gift will ensure these saints are a source of inspiration and joy to parishioners and visitors to our Cathedral precinct. Three bronze sculptures by Alan Somerville have been commissioned to honour the graciousness of God here in the heart of our Archdiocese. It is our desire to share the blessing and protection of these beloved saints with all who pass through. They will be places for quiet contemplation or personal devotions. Through these permanent art installations, the love of God will be shared with the greater community. 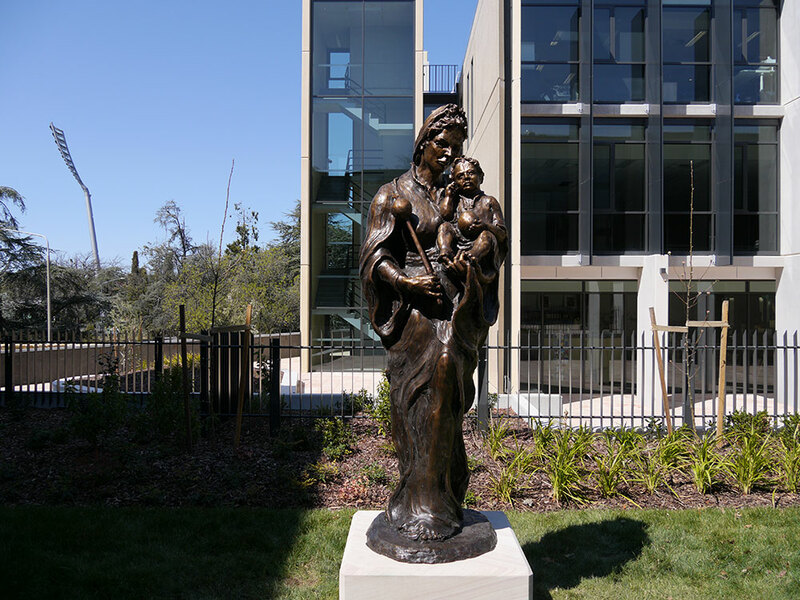 Residents and visitors at the Marian @ Manuka Independent Living Units are further reminded of the protection of Our Lady after the arrival and installation on Monday of a bronze statue of Mary Help of Christians. The sculpture adorns the front lawn area of the units and was crafted by Alan Somerville from Sydney. He was commissioned by the Archdiocese to undertake the project two years ago and says he was honoured to be selected. With 30 years of experience and a proven track record in sculpting, some of his other works include the ANZAC soldier on ANZAC Bridge in Sydney and the Sir Henry Parkes figure in Centennial Park Sydney. In making this latest artwork, Mr Somerville says he drew inspiration from various pictures and photos of Mary Help of Christians. His latest statue stands 2.5 metres high. Mr Somerville said it takes approximately six months from the design stage to installation. The statue was made in Strathfield, but the 50cm plinth which it stands on is from a sandstone local to Gosford. Over the next 12 months, Mr Somerville will be busy making sculptures of St Mother Mary of the Cross MacKillop and St Christopher, both which will also be located at the St Christopher’s precinct in Manuka. There are particular times in our lives when we consider the people and the values closest to our hearts. One beautiful way to acknowledge the significance of family members and friends, our church and our community is through a gift in our will. By choosing to leave a gift in a will, or to make a donation in memoriam, we honour the people and the church that have been central to our lives. A gift to the statues of St Christopher’s precinct is one such way to create a special lasting legacy. >> Click here to Donate Now.